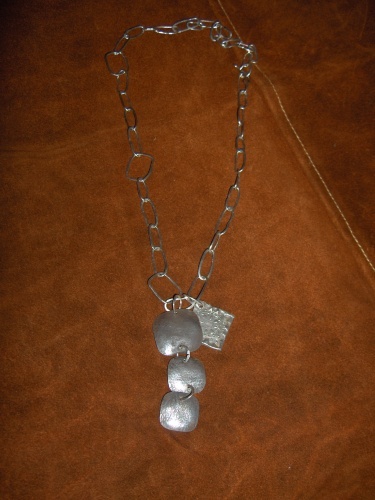 Hand forged fine silver chain with various shapes and sizes of links. Sterling toggle closure, sterling three square textured pendant and Precious Metal Clay (fine silver)pendant. This very little sea treasure found by me while on a walk around the shoreline. The real sea glass is encompassed on a totally sterling silver and hand completed back plate. Measures a 1/2 long and goes with a sterling silver chain. needle up under the string leaving a similar dot the needle3 just left. Try not to pull all the string through...allowing a circle to go the needle through. Presently pull it through and the circle fixes into a half-hitch tie.